At the November 2016 meeting, we were entertained by a very interesting talk entitled ‘A virtual pub crawl through Victorian Leicester’ given by Laurence Lock, one of our members. Laurence has done a good deal of research on the inns and pubs of Markfield and Leicester and we were promised an informative journey from Markfield to Leicester, looking at the pubs and inns along the way as they would have been in 1885. At this time Queen Victoria was on the throne, and Leicester could boast more than 450 pubs, with a population of 138,000 people. This article picks out some of the highlights of the talk. We began our ‘journey’ in Markfield, where we learnt that one of the pubs still in existence today, the Bull’s Head, dates back to the 1700s. There were, we calculated, 13 pubs in the village at this time including The Earl Grey pub on Main Street which is now Bown’s Hardware shop, and the George on Main Street, now part of the Co-operative store. The Red Lion, now an Indian restaurant and takeaway, again on Main Street, also dates to the 1700s (but not the present building!). The Queens Head and the Coach and Horses are still familiar pubs today. On the way into town we passed The Stamford Arms in Groby, which is notable as the birthplace of William Everard in 1821. The licence and name were reputedly transferred from The Stamford Arms on Ashby Road in Markfield, when the licensee moved. Approaching the centre of Leicester along Woodgate, we encountered the Old Robin Hood. This was an old inn, it was fully licenced to sell wine and spirits as well as beer. Originally the called the Golden Fleece, its name was changed in 1846. It was later rebuilt and today is run as a Shisha bar. Opposite was the Friar Tuck, which was built as part of the Victorian housing development, but closed in 2007 and is now a tattoo studio. Other pubs on our route include the Cricketers’ Rest on Abbey Gate (pictured), which is to be refurbished in 2017 and occupied by Anicca Digital. 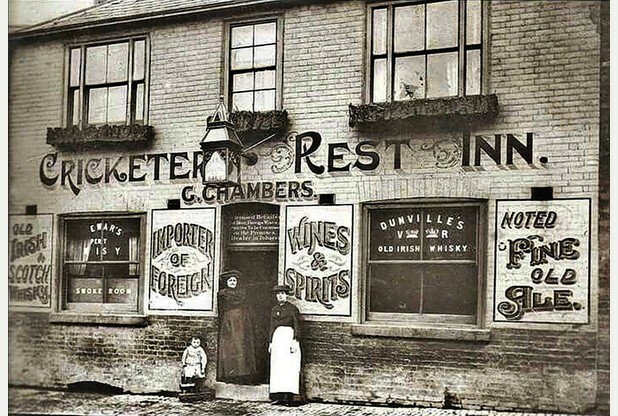 George Chambers was listed in Wright's Directory as the licensee in 1899. Slightly further along was the North Bridge Inn, on the canal at Frog Island (now a rather untidy private residence). The street scene in this area has changed enormously, both as a result of the building of the Great Central Railway in the 1890s and the demolition of the railway bridge across Northgate Street (near Sanvey Gate) in 1981. We continued on into Leicester, passing a great number of pubs, and then began to think about which pub in the city can claim to be the oldest. The Bowling Green (known as the Polar Bear around 2010 because of its proximity to the former Fox’s Glacier Mint factory and the ‘Peppy the Polar Bear’ mascot) is sometimes said to be the oldest. However, depending on how you define “oldest”, other pubs may be in contention such as the Crown & Thistle on Loseby Lane (now part of O’Neill’s), the nearby Globe, Molly O’Grady’s on Hotel Street (for many centuries called the Saracen’s Head, and undergoing refurbishment and rebranding in 2017); or even the Queens Head on Guildhall Lane, which ceased to be a pub from 1913 until 1998 and now operates as Taps. Today’s The High Cross pub at the top of High Street at the junction with Highcross Street was a coffee house in 1885 (rebuilt in 1895) and part of the Temperance Movement. Coffee houses tried to take business from the pubs by (for example) having meeting rooms where guilds and other groups could meet. The Temperance Movement created a map showing all the public houses in Leicester, calculating that there was one licence for every 186 people and 1 pub for every 36 houses! The talk finished at the Golden Lion (on the corner of Highcross Street and the former Thornton Lane), which was demolished when the Southgates underpass was built (1966-68). This would now be part of Jubilee Square. It is clear that, today, the majority of pubs from this period no longer function as pubs but, if you look closely at the buildings, many still exist in another role. Laurence’s talk certainly made us realise how much has changed or disappeared since the 1880s, both in Markfield and Leicester, and everyone enjoyed the journey back through time. At the September 2016 meeting of the Markfield Local History Group, Michael Ball gave a talk entitled ‘A timeline of ecclesiastical history and the rise of Nonconformity in Markfield (Mercenfeld) and its neighbouring parishes AD 1200 to 1900’. He used information from a range of historical documents to give an insight into the life of the church over the centuries. Apparently, one vicar of Markfield in the medieval period had to go to court for chasing wild animals!There were links between Markfield village and Ulverscroft Priory, before the Dissolution of the Monasteries in the 16th century. In 1503 the priory gave bread to Markfield at a time when the villagers were suffering from plague. At the Reformation, during the reign of Henry VIII, we learnt that the vicar of Markfield, Thomas Whalley, earned £4.00 per annum, which was considerably less than the clergy in other parts of Leicestershire. In the reign of Queen Elizabeth I, any person who did not take Holy Communion would be fined – initially one old shilling but this quickly increased to a £20 fine which only the very rich could pay! In 1645, during the siege of Leicester which formed part of the English Civil War, Captain Robert Sykes of Markfield led his men into Leicester having broken through Rupert’s Gateway. It was fascinating to learn that John Bunyan, the author of ‘Pilgrim’s Progress’, was one of the Roundhead soldiers who occupied Leicester and was due to be on sentry duty at Rupert’s Gateway. However, another soldier took his place and was killed. Had Bunyan not survived, then his famous work would not have been written. We learnt that William Purefoy, Rector of Markfield, was removed from his living in 1643 but was restored in 1662 when Charles II was King. By 1646, non-conformists were appearing in Leicestershire, for example there were Quakers and Baptists in Glenfield. A non-conformist did not attend the Church of England, but instead was a Quaker, Methodist, Baptist, Congregationalist, or similar. Gradually, non-conformists were allowed to worship in their own ways. Bardon Chapel, near Markfield, is approximately 300 years old and a good example of a very early non-conformist place of worship. Selina, Countess of Huntingdon, was a non-conformist who met John Wesley and introduced him to the Reverend William Ellis of Markfield. In 1741 Wesley was invited by Selina to stay in Markfield and over time he preached 13 sermons here. There is a plaque near St. Michael’s Church gate which tells of his visits. The 19th century saw the building of a number of Methodist Churches in the village and also a Congregational church. The talk finished with a lively discussion regarding the chronology and denominations of the various Church buildings in the village in the 19th Century and how this may have changed. The oldest Methodist chapel in the village was built in 1811 at the top of The Green and Holywell Walk and has recently been transformed into two dwellings. A very well attended March 2016 meeting heard Peter Liddle MBE, former County Archaeologist for Leicestershire, give a talk on the Houses of the Greys - Groby Old Hall and Bradgate, with reference to the archaeological and standing building evidence. This was a very interesting session, and well worth attending. The May 2015 meeting found us at Ulverscroft Grange on a warm, clear evening. We started with a walk down to the remains of the stream-fed pool, believed to have been built in the 1930's for the children of the house. History group members rediscovered the pool in 2014 whilst researching the history of the Grange, and have been clearing the undergrowth to reveal the original brickwork and pool layout. We then reconvened at the Grange and learned about the considerable researches into the history of the Ulverscroft area, the house, the families who lived there and the families to whom they were connected. Well known Leicestershire landowning families featured, together with local 'self made' industrialists and bankers of the nineteenth and early twentieth centuries. Now, the history of the Grange continues to evolve, as it is owned by the Shuttlewood Clarke Foundation and is a Well Being and Community Centre. The History Group hopes to publish the results of its research in due course. At the March 2015 meeting, we once again welcomed Ernest Miller, this time to talk about the River Lyn. We learnt about its source from deep underground upstream of Ulverscroft Priory and the consequent all-year round warm temperature, and its journey through Newtown Linford, Bradgate Park, Cropston and Swithland reservoirs and finally through Quorn and into the River Soar, including a number of name changes along the way. We were fascinated to hear about the many man-made changes over the years, including altering its course to create a water meadow where the grass would grow early in the warm water, eel traps, the probable early leat (a man-made stream or channel) to feed the pond at the back of Bradgate House and the later Victorian 'ponds' in Bradgate Park to collect silt ahead of Cropston reservoir, together with water cress beds and powering a number of water mills along its course. At the November 2014 meeting, we were treated to a most interesting talk by Ernest Miller on the nearby Stoneywell Cottage (recently acquired by the National Trust) and the Gimson Family.In October 2014, we were privileged to hear a very informative account of the village cinemas of Leicestershire by Brian Johnson. This included, of course, Markfield's own early cinema at what was to become the 'Memorial and Miners Welfare Institute' on Main Street.In June 2014, the group visited the model railway at the nearby Ulverscroft Grange, home to the Shuttleworth Clarke Foundation. This was an excellent evening, where we learnt about the history of the railway, observed the 'signal box' in operation and watched the 'drivers' controlling their trains to the signals. Previous meetings have included a fascinating talk on the 400 year rule of the Romans in Leicester, a walk around Georgian Leicester, how to trace the history of a house, an insight into life in the Leicestershire coal mines from 1954 to 1980, the privies of Leicestershire and Rutland, an account of the Whitwick Colliery disaster and a visit to the Leicestershire Records Office.